Automated and smart-home designed lighting packages not only enhance the beauty of your already beautiful home and offer the ability to have the perfect lighting settings at any given time in any part of your home, they also can deliver huge energy savings through the ease and ability to dim lights and turn them off automatically. Think of it: You say, “Alexa, dim kitchen lights to 50%.” And you watch with satisfaction as the lights dim down accordingly. Or, you say, “Alexa, turn off the family room lights.” And the kids know immediately that it’s time for bed! This capability is available to you now and throughout your whole home! These options, and so much more, are available to you through the lighting control solutions provided by Smooth Automation. Smooth delivers customizable control of ALL the lights in your home. Our partner Crestron is one of just a few of our sources of high-end lighting control technology. Frankly, there are not many manufacturers that can meet our exacting standards on behalf of our homeowners. Crestron products are built to world-class technical standards and are of the highest quality. They have been installed in thousands of homes, offices, and commercial settings around the world. 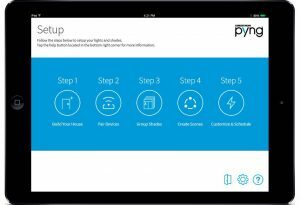 Crestron Pyng® technology enables set-up and control of your luxury home’s automation right from an iPad®. Smooth’s technology integrators can create for you lifestyle scenes for each room, schedule events, and much more without ever opening a laptop. It also empowers you to confidently make changes to your scenes, settings, and even system schedules with just a few taps on an iPad or touch screen. Using Crestron products Smooth delivers the ultimate in luxury. Easily and quickly. Crestron Pyng® technology supports hundreds of Crestron’s world-class products, making it fast and easy to deliver luxury home automation on any scale. It delivers a truly spectacular homeowner experience with user interfaces that include intuitive drop-down and slide-out windows and scrolling lists on all devices. The lighting control packages and systems used by Smooth tie into your home’s other access controls with features like a programmed “Good Night” option that turns on the porch lights, ensures the garage doors are closed, locks the doors, dims lighting, and more. You control it all with a device like an iPad, a centralized control panel, or by commanding “Alexa” to do it for you. You will be amazed by the sheer power of it all. These features also further enhance the security settings of your home. Envision using an iPhone, for example, to easily adjust the lighting throughout your home to ensure that rooms always look their best and enhance the comfort and enjoyment of visitors. Touch the “Ready to Sleep” setting on your device and ease your kids into bed for a great night’s sleep. Smooth offers comprehensive lighting control solutions for any project—large or small. We provide wired and wireless control solutions that can seamlessly integrate with other systems to automate your entire house. Whether new construction or a retrofit project, Smooth has the perfect solution for your lighting needs. Click here to schedule an automated lighting consultation and learn how Smooth can augment yours and your family’s lives at home. Today!